Lynx, the Lynx, sprawls faintly between Auriga-Gemini and Ursa Major, its brightest star Alpha Lyncis seen about three-quarters of the way up the left-hand edge. The third star over to the right of Alpha is 10 UMa, which is seen down and to the left of Ursa Major's western-most "leap" (Talitha and Kappa UMa, toward upper left). 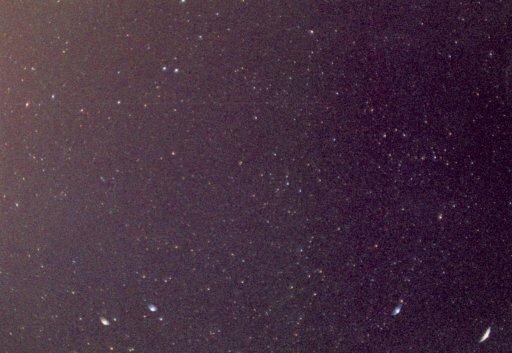 To the left of center is the only named star, Alsciaukat (31 Lyncis). North is up and to the right. Near bottom left are Castor and Pollux in Gemini. The bright star at the lower right corner is Capella in Auriga. For more on Lynx, see The Lizard and the Lynx at Stellar Stories.